Despite the precautionary measures taken by the Mumbai civic body, waist-deep water was observed in some areas of the city. Flooded roads have been reported from Dadar, Parel, Cuff Parade, Bandra, Borivali and Andheri. 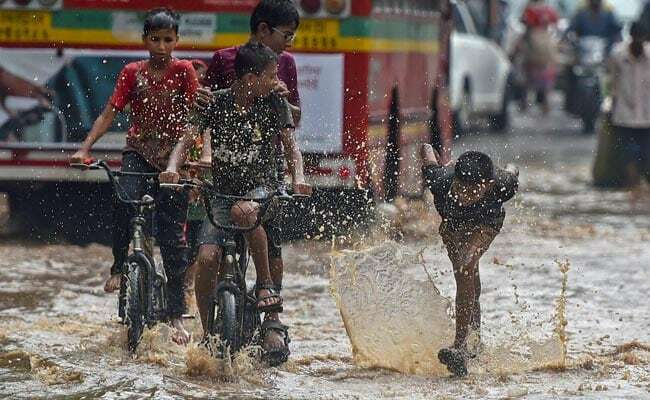 Mumbai: Monsoons played truant in Mumbai today, but the build-up continued. Heavy rains since morning flooded roads, delayed trains and diverted at least one flight. Navy personnel will be posted from tonight in parts of the city to help with the operations. The met department has said these are pre-monsoon showers and the monsoon will hit sometime over the week-end. Disaster management authorities have warned about very heavy rainfall over the next 24 hours. Private weather forecast agency Skymet said with dense low clouds over Mumbai, visibility in the city has reduced to 500 metres. Rains will intensify in the evening and wind speed is likely to exceed 50 km per hour. "Monsoon has reached Goa and it can take up to 72 hours for it to reach Mumbai. There will be heavy rain on June 9," met office director Ajay Kumar told NDTV. The met department has advised people not to step out of home on Saturday and Sunday unless necessary. The waterlogging has hit rail services, with the local trains running around 20 minutes late. Several trains were reportedly forced to wait as power supply was disrupted as well. A Jet Airways flight from London to Mumbai was diverted to Ahmedabad airport due to heavy rains. Eight other flights of different airlines were diverted to other airports on account of congestion at Mumbai. In the evening, navy personnel will be posted in Colaba, Worli, Ghatkopar, Trombay, Malad for flood rescue, reported news agency Press Trust of India. Officers have been asked to keep schools open at all times for shelter during possible flooding. The Mumbai civic body has taken a number of precautionary steps that include cancellation of leaves of senior officials over Saturday and Sunday. The usual date for onset of monsoons in Mumbai is June 10, This year, met office had forecast early rains.